KEEP YOUR VALUABLES DRY: Removable and waterproof orange interior liner perfect for storing valuables. 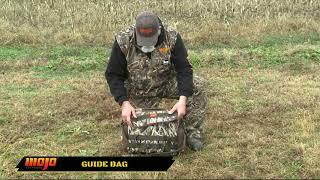 The MOJO® Guide Bag was crafted with a durable water resistant material in the Mossy Oak® BLADES camo with a removable and waterproof orange interior, maximizing comfort and convenience. Holds decoy and hunting accessories such as extra 6V rechargeable batteries, extra wings, remotes, phone, laptop, etc. Perfect for carrying your gear to and from the blind or for everyday use outside of the blind.